When Pittsburgh acquired Chris Kunitz in 2009, the Penguins hoped the winger would adequately fill a role within the club's top-six. To say that he met those early expectations would be an understatement. But, make no mistake, Kuni's brand of hockey provides the perfect compliment to his superstar center's strengths. The left wing's physicality and scoring touch (along with Pascal Dupuis' blazing speed and responsible, two-way game) have helped shape what many consider to be the best line in hockey. Consequently, it's no surprise that most pundits regard pulling the trigger on the Chris Kunitz deal one of Ray Shero's most brilliant decisions as G.M. 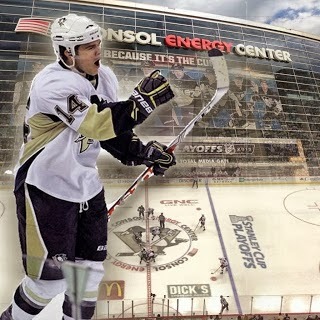 of the Pittsburgh Penguins. Take a look at Kuni's career numbers. The undrafted free agent out of Ferris State has always put up respectable numbers but his productivity has spiked over the last few years. In fact, since the start of last season, Kunitz has actually evolved into a point-per-game player, posting 68 points in 64 games. Furthermore, the 38-goal pace he found himself on last season would have shattered his career high of 26 tallies. Some may argue that Kunitz benefitted from a truncated campaign, that he couldn't possibly keep up such a pace over 82 contests. Time will tell if that proves to be the case but, so far this year, Chris is making a case that last season wasn't a fluke. And, when you combine Kuni's knack for burying pucks around the net with Crosby's elite play making abilities, it really wouldn't be that big of a surprise to see Chris have another career year at the age of 34. Without question, Chris Kunitz has been fortunate enough to skate on arguably the most lethal forward unit in hockey for several seasons. However, that line hasn't always consisted of the same individuals. When everyone is healthy, Kunitz, Dupuis and Crosby combine to form the most formidable trio in the NHL. The line creates the perfect storm in terms of nightmare matchups for opposing coaches: Sid's elite skill and creativity, Pascal's speed and tenacity and Chris' physicality and net-front presence. As a result, the Penguins' top unit perennially finds itself among the most productive lines in the league. When Crosby missed significant time in recent years, though, Kuni skated alongside Evgeni Malkin and James Neal to, once again, form a nearly unstoppable group. The trio, for example, combined for 116 goals and 251 points in 2011-12, as Malkin captured the Art Ross and Hart Trophies while Neal posted a career-best 40 goals. And, while he didn't accumulate the same amount of points or accolades as his line mates, you can bet that Kunitz was a vital part of their success. And, while most would assume complimenting superstars such as Sid and Geno would make life easier for virtually anyone, Kunitz is, in reality, the only winger to find sustained success alongside both centers. Subsequently, Chris Kunitz has transformed himself from that undrafted free agent into Olympic hopeful for the 2014 Sochi Games.